Images were taken every 10 seconds. So when you see a moment of faster movement you know that the plant did that at a rate faster than 10 seconds. Today I fed my D. natalensis a flightless fruit fly. This video shows MOST of the movement the plant made to eat the fly, unfortunately not all of it. The smaller tendrils directly under the fly that initially moved had already done so by the time the timelapse started running and then my camera card ran out of space 1,719 images into it. I will make sure the entire movement will be captured in my next video so hopefully you will come back and enjoy that one too! 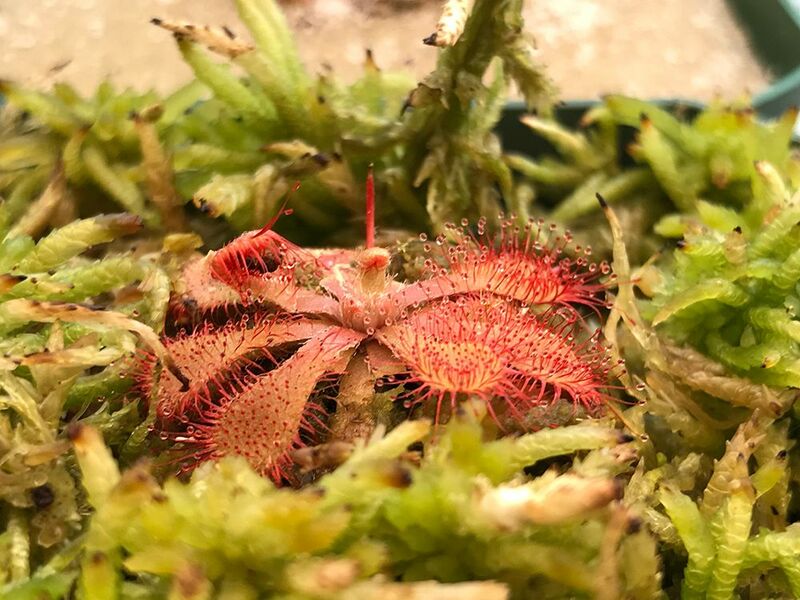 I had an old Blog I wanted to start a few years ago called Indoor Carnivorous Plants that I am excited to finally work on! It's going to be one of my 2019 resolutions! I am going to blog about my adventures and share my experiences hopefully teaching others some options for growing their plants indoors. I mention this, because I needed a YouTube account to post this timelapse to so I finally made use of that old blog and its gmail address! It's going to be fun filling that channel up with more content in the future! Last edited by Odysseus; 12-27-2018 at 02:04 PM. Hahaha yeah no kidding! While I watch it, I always add in sound effects for what a begging for its life fruit fly would sound like. There towards the end of the timelapse the fly seems to have resigned himself to his fate and stops moving as much but his front legs are in a begging pose. hehe a bit morbid but I suppose as CP lovers we get pass for being okay with the wholesale murder of insects due to our plants. Oh I forgot to mention it! Images were taken every 10 seconds. So when you see a moment of faster movement you know that the plant did that at a rate faster than 10 seconds. You can scrub the frames on my end and it is quite shocking how much movement happened when the leaf LIFTED on the end. It does that movement in only a few frames so it had a minute burst of movement to do that. SOOOO awesome! HAHAHA Amen to that! It IS really sweet. I might just feed one or two more leaves tomorrow and then call it good for 2 weeks. Reality of life ... kills in nature are seldom gentle or even quick. Instead, death is often brutal and cruel .... whether one is watching orcas violently "play" with their hapless prey before finally making the kill, or an animal chewing or ripping chunks out of another animal even while the prey animal is still very much alive. Little Shiny Black Bugs of HORROR!! !